I firmly believe that the experiences I have had as an undergraduate are unique to UMBC due to the commitment to diversity, involvement, and community engagement. Cheyenne Smith is committed to addressing the education gap in urban communities, a passion she developed through UMBC leadership positions and internship experiences. Smith worked as a program assistant for the Baltimore RISE Fellowship Program and a service learning intern for The Shriver Center at UMBC. She credits the center for exposing her to a career path that she hadn’t considered before by helping her forge deep ties to Baltimore communities. Smith also served as president of UMBC Mock Trial and led the team in two consecutive bids to the American Mock Trial Opening Round Championships and first prize in the inaugural Charm City Classic Mock Trial Invitational. She is active in numerous campus organizations and has been recognized through the Samuel I. Rosenberg Fund Award, President’s Fellow Award, and France-Merrick Service Scholarship. Following her passion to serve the Baltimore community, Smith plans to join The Choice Program at UMBC as an AmeriCorps Community Service Learning Fellow. 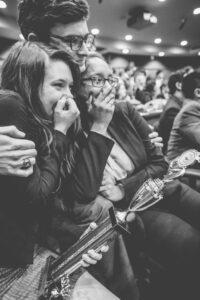 Video: Cheyenne Smith describes her experience competing in Opening Round Championships with her UMBC Mock Trial teammates. Images: Cheyenne Smith with teammates after winning a bid to the Mock Trial Opening Round Championships for the first time in school history; photo courtesy of Cheyenne Smith. Portrait by Marlayna Demond ’11 for UMBC.